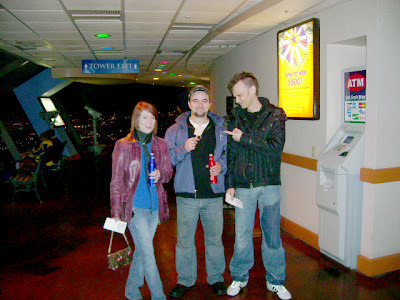 ★ LOOGAROO ★: NATPE 2007 | VIVA LAS VEGAS! 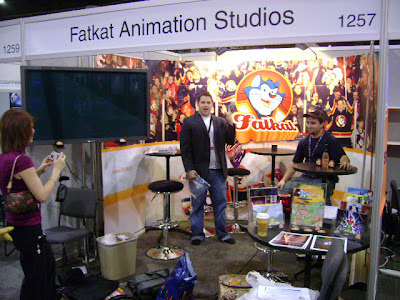 NATPE 2007 | VIVA LAS VEGAS! This year we'll be attending several festivals conferences and tradeshows, hell in a week a whole slew of us will be in NYC for the annual Kidscreen Summit. 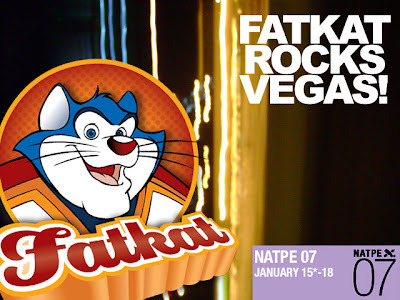 This year's NATPE show in Las Vegas was extra special, not because we scored some amazing gigs, or the fact that we are on the cusp of signing some of the biggest deals in our company's history for OUR own shows! 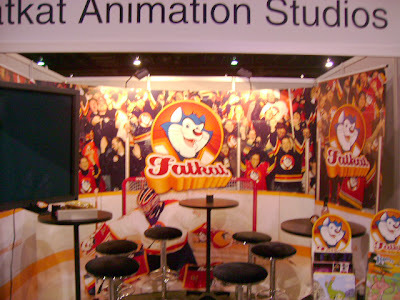 No, it was extra special, because we got to show off our new booth! Once landing in vegas, the first thing any good producer of entertainment should do is grab some beer and ice cream and continue to chase one with the other until a refill is needed. The second thing that should be done is to begin the set up of the new booth! How cool is that?! We went with a hockey theme, because we're uhm, Canadian and those that are not Canadian would expect us to do such a thing. Play to the stereotype is necessary sometimes. 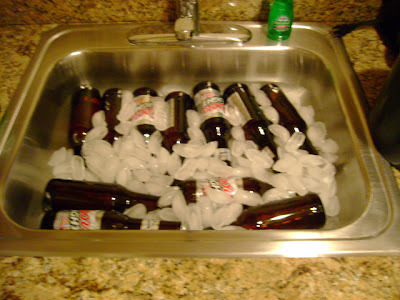 The third thing that anyone who has some self respect would do is pack the kitchen sink with beer. That's just a no-brainer. Speaking of defeat, shortly after Buddy posed for this picture with Chuck "The Iceman" Liddel, buddy broke out of one of Chuck's leg locks and proceeded to pummel him with the thick end of a champagne bottle. 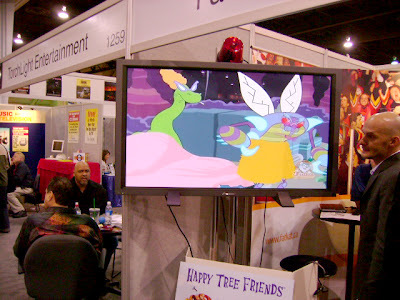 We showcased several of our live action and animated shows at our booth, the "My Adventures with Cloe" pilot that we created with Big Hug Productions caught the eye of the head writer for the Tonight Show! They plan to feature a bit of it on the show tomorrow night! Wednesday January 31st at 12:35 AST! Set your VCR'S !! 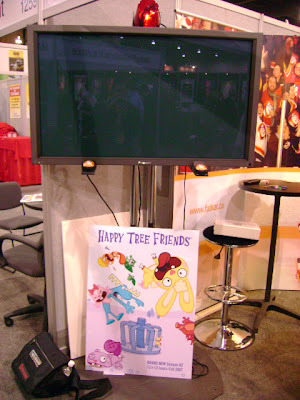 We also had the pleasure of sharing our booth with the great folks at Cinema Management Group who represent the Mondo Media series Happy Tree Friends! Man I love those guys, good people, great projects and the smell great too. 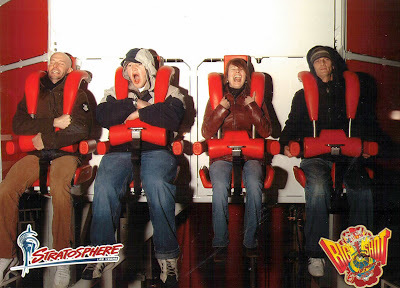 In the middle of the conference, Keith Bryan, Tracy and Buddy all decided to stop what they were doing and climb a 112 story tower to ride the Big Shot amusement ride. Well, well, don't they look amused?! Check out Buddy, he looks calm enough about it, moreso then Bryan, however look how white his knuckles are as he clings tenaciously to the undersides of the armrests. hehehe. 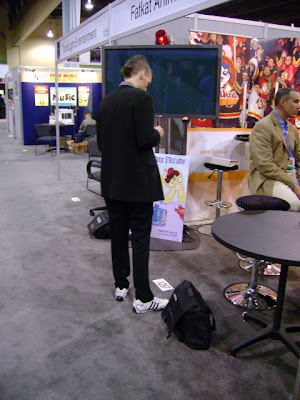 Buddy was so worked up about that ride that he actually lost his dress shoes, he had to wear soccer shoes to the tradeshow the next day. Tracy tried to make him feel better, but it was no use. Don't worry Buddy, we'll get you some new shoes. Thanks for an amazing NATPE everyone!